Ground clearance is the open space below your scooter chassis. It is important to know your scooter's ground clearance so you can safely travel uneven terrain or bumps without getting stuck. 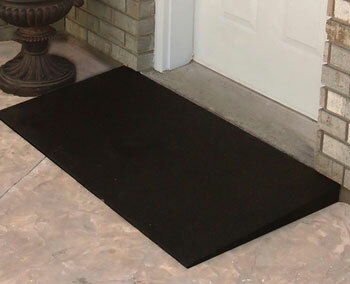 Depending on your door thresholds, some scooters may not have enough ground clearance to cross over the threshold. A small threshold ramp can help fix this. Or you can select a scooter with a higher ground clearance. Ground clearance can also be important when driving on uneven terrain outdoors. Your scooter might drive over a rock with the front wheel(s) but because the ground clearance isn't high enough, the deck of the chassis might get stuck. Heavy Duty 2.5" - 7"
Information about a particular scooter's ground clearance can be found on individual product pages.